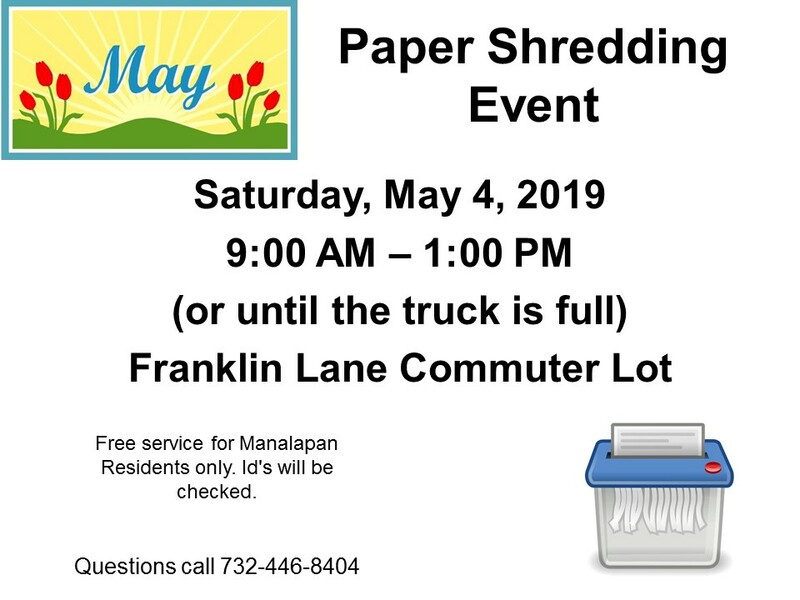 Manalapan Township will be holding a paper shredding event for the residents of Manalapan. The event will be on Saturday, May 4, 2019 at the Franklin Lane Commuter Lot. From 9:00 am - 1:00 pm or until the truck is full. This is a free service for Manalapan Residents only. Id's will be checked. It is time for you to dispose of old documents and confidential files safely. Come to our mobile paper shredding event! Bring all old documents and confidential papers. Don't become a target for identity theft. All papers will be shredded on location (Franklin Lane Commuter Lot) in the mobile truck! The lot is located parallel with Route 9 North and is in the vicinity of the Gordon's Corner Road and Route 9 Intersection. Right behind the Gordon's Corner Road bus stop. Remove all metals and binder clips from paper. No more than 100lbs of paper-approximately 4 boxes per person. This is a free service paid for with the State Recycling Grant.